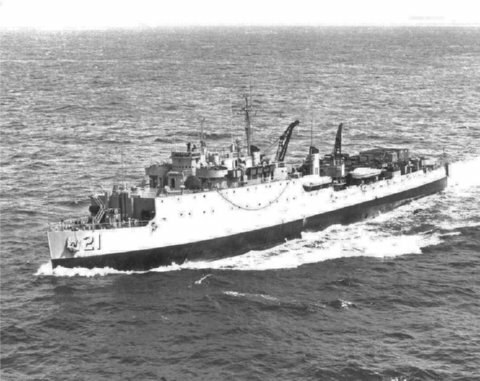 Fort Mandan was assigned first to the Atlantic Reserve Fleet following her shakedown training in Chesapeake Bay but later was assigned to duty with the Service Force 2d Fleet. She spent the next year in routine operations off the Atlantic coast. In April and May 1947 she participated in 8th Fleet exercises and cruised with the Naval Academy and NROTC midshipmen to northern European ports during June and July. On 16 January 1948 she was placed out of commission in the Atlantic Reserve Fleet. The outbreak of the Korean war occasioned her reactivation and on 25 October 1950 Fort Mandan was recommissioned with Captain Philip D. Quirk USN commanding. In December she joined the Amphibious Force Atlantic Fleet. During 1951 she engaged in Atlantic Fleet exercises through 17 May conducted drills in the Caribbean Sea through 29 August and following a brief cruise in Caribbean waters underwent preparations for the "Convex" operation which occurred from 28 February to 31 March 1952. Fort Mandan participated in the first NATO maneuvers Operation "Mainbrace" in August and September 1952 and cruised with the 6th Fleet in the Mediterranean from October to January 1953. Returning to the United States she exercised in the Norfolk area until September when she weighed anchor to take part in Operation "Sunec" with calls at Greenland Labrador and Newfoundland. During 1954 she was overhauled at Norfolk Navy Yard took refresher training at Narragansett Bay and another "Sunec" cruise on which she visited Baffin Island Labrador and Newfoundland. Two training cruises in the Caribbean in 1955 were succeeded by a third "Sunec" deployment on which she crossed the Artic Circle for the second time. In 1956 Fort Mandan conducted amphibious training exercises at Vieques P.R. and underwent overhaul at Baltimore before steaming again for the far north where she cruised in September and October. Amphibious exercises again occupied her during November 1956 and much of 1957 when she joined in "Caribex" in the Canal Zone and "Narmid"
From September through November 1957 she was attached to MSTS for Arctic Service successfully transporting Army men and equipment from Greenland to Newfoundland and Virginia in a winter closing-out operation. Caribbean exercises kept her active during the first half of 1958. In the summer months she received an overhaul at Norfolk to prepare her for more exercises in the Caribbean and a cruise to Halifax and Argentia in November. In February 1959 she joined the 6th Fleet for maneuvers in the Mediterranean where she remained until August. In the fall Fort Mandan operated from Little Creek Va. in conducting drills and exercises along the Virginia Capes area and in 1960 she again carried troops and equipment for amphibious landings in the Caribbean.